Explain how the visibility and ceiling values of the aviation parameters are calculated. 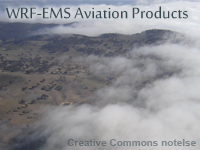 List the advantages and limitations of the visibility and ceiling parameters provided by the WRF-EMS. Appropriately use aviation parameters provided in the WRF-EMS to create an aviation forecast (TAF) for fog.